Online advertising revenues are on track to surpass radio sales within a year or two, but Google’s seemingly helpful new plan to broker unsold radio inventory could hasten that day by undermining the price of radio spots. With online ad sales continuing to grow at something like 30% annually, Internet sales are likely to equal or beat radio revenues in 2008 and almost certainly will overtake them in 2009, according to Zenith Optimedia, the marketing strategy arm of the giant Publicis advertising group. In 2008, says Zenith, Internet and radio sales will be roughly $37 billion apiece, with radio possibly half a billion bucks ahead of online. By 2009, it will be no contest. Online sales of an estimated $42.7 billion will outstrip radio’s projected $39.5 billion. 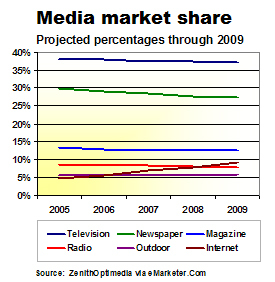 Zenith’s take on the anticipated realignment of the media marketing mix is illustrated in the graph below. The data originally was published at eMarketer.Com. In light of the likely trend in radio sales, it is perfectly understandable that broadcasters paid attention when Google, the biggest and most powerful online media company, came up with an idea to help them sell more advertising. But there’s a catch. If Google’s system to broker unsold spots were widely adopted by radio advertisers, broadcasters would lose control of the pricing and customer relationships that substantially empower their franchises. This would turn them into second bananas, resulting in the consequences previously discussed here. The radio ad initiative is similar to Google’s efforts to broker unsold space in newspapers and magazines, a notion that poses the same peril to publishers as it does to broadcasters. But the radio plan seems far more sophisticated – and thus far more dangerous to broadcasters – than Google’s rinky-dink fling to date at selling print advertising. Google’s radio venture started earlier this year with the purchase of dMarc Broadcasting Inc. for $102 million, plus more than $1 billion in additional compensation, if the company performs as hoped. Here’s how the business works: dMarc peers into the ad-trafficking systems of participating radio stations to identify unsold advertising spots. Then, it sells the excess inventory at discount prices in the way Wal-Mart dumps Halloween candy on Nov. 1. Google intends to expand the potential universe of radio advertisers by selling spots through the sort of online bidding system it used to auction more than $9 billion in keyword ads in the last 12 months. Google lets advertisers target the day part, geography and radio genre they want for their ads. When dMarc identifies an unsold 30-second slot meeting an advertiser’s specifications, it sends the radio station the spot previously recorded by the winning bidder. The station airs the spot, picks up some spare change and the dMarc guys close in on their billion-dollar earn-out. Although everyone agrees it is better to get something, instead of nothing, for a spot you otherwise wouldn’t have sold, some broadcasters fear dMarc’s success could come at great expense to their business. To the degree the system catches on, they reason, marketers will stop buying advertising from them at full price and start picking it up at discount rates from Google’s ever-growing inventory of unsold spots. They could be right. Unless Google attracts a significant number of new advertisers to compete for the finite number of spots available through dMarc (which seems implausible), the market could become so efficient that the per-spot price of advertising would come down. Although advertisers would win by cutting their costs and Google would win by growing its sales, a significant decline in the value of radio spots would be disastrous for anyone owning a broadcasting company. Maybe this is why the folks running Clear Channel decided to take some of their chips off the table.